You will earn 27 points which is the equivalent of $1.35. Are you still searching for that right AUDIO REPEATER / SOUND FX for your Home Haunt or your Professional Haunted Attraction? 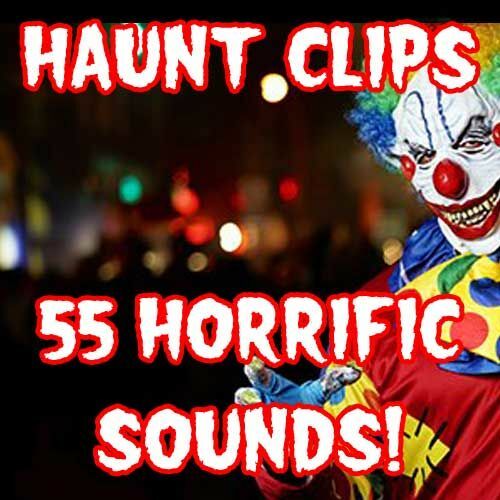 HAUNT CLIPS are of the "HIGHEST QUALITY" and created in our digital studio. Audio repeaters with the right sound FX will create the "PERFECT SCARE", use HAUNT CLIPS for your pneumatic props, sensors, boom-box or with your actors. HAUNT CLIPS will startle your guests with the "MAXIMUM SCARE FACTOR" as they go through your maze of FEAR! Your guests will "NEVER FORGET" how "SCARED" they were when visiting your Haunted Attraction or Home Haunt. This is how other customers reviewed 'HAUNT CLIPS DIGITAL DOWNLOAD'.